This is, of course, one of the great critically acclaimed plays of the 20th century by one of its greatest playwrights, depicting the Salem witch trials at the end of the 17th Century whilst parodying the McCarthy Communist witch hunts of the mid-20th. Being just as powerful as any Shakespearean tragedy, it is, however, neither an easy play to perform, nor is it a comfortable watch for its audience, as I will elude to later. It takes a very considerable combination of skills to pull it off and it is a serious challenge for any group. 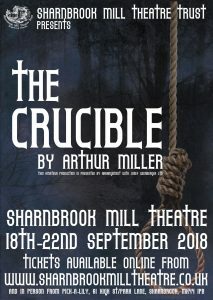 It was with keen anticipation therefore that I was looking forward to seeing the full resources of Sharnbrook Mill Theatre being brought to bear on it. I was not to be disappointed! The set constructed by The Monday Team was an appropriately simple bare stage, the back walls lined to depict the stark lines of the wooden architecture of the puritan period, with a fireplace to one corner for the interior of the Proctor’s home, and a roofline depicted by rough-honed, fencepost style, poles horizontally positioned at intervals across its length. The rest of the scenes being changed by the cast using only stark, period, wooden furniture. And very effective it was too. Lighting designed by Valdis Bulazs and operated by Sam Whatley and Emma Langmaid was a sepia wash perfectly depicting the interior gloom of both the sparsely lit dwellings and the mood of the play. We did have a few odd lighting changes during scenes which were either a couple technical glitches or deliberate mood changes, which if so I’m afraid I failed to note their significance, but as an overall effect were otherwise spot on. Sound effects (uncredited) operated by Sam Toner were also very effective and the sound of that rope stretching on the gallows at the end of the play will live with me for some time to come. Quite eerie to say the least. Nice job! Costumes by Virginia Pope, Ann West, Phil Wise and Kathryn Rose were, as one has come to expect from this team totally authentic and heavy detailed with their usual attention to detail being second to none. Props by Sue Lander, Zandra Saxby and Caroline Graham completed the team with some nice touches, especially the little poppet and the handmade muskets . Stage Manager Brian Wood and his team had set the scene perfectly for our actors to do their stuff. And that they did in spades! Director Michael Horne had certainly put some work into this production, his cast were well rehearsed and well drilled and the scenes cleverly plotted. The performances he pulled out of his actors were both powerful and mesmerising, my concentration was never allowed to wander for a moment. The sheer amount of line learning required for this heavy weight three-hour drama with not a hesitant moment (at least none that I spotted) was to be admired on its own. Especially as according to the production notes they had battled medical problems galore, not to forget the incredible heat of this year’s summer. static nature of the actors just left watching a scene. I know its very hard to concentrate on continuing to react during long scenes, but actors left in static positions with nothing to say with expressionless faces did on a few occasions feel a little unrealistic. That said, there were times when this was handled exceptionally well such as the impromptu court scene where Giles Corey (Jon Coop) and Francis Nurse (Wayne Marriott) were seated at the bench unable to speak whilst their wives were being condemned. Body language and dejected facial expressions capturing the hopelessness and sheer illogic perfectly. All the characters were well-played and some were quite frankly outstanding! Tim Jackson-Waite’s professional training and experience showed through in spades, his portrayal of John Proctor was incredibly powerful, and he put so much into it he clearly had little left in the tank at the end of the show. The scenes between him and his wife Elizabeth, again outstanding played by Leisa Cooke had a chemistry all of their own. There wasn’t a pair of eyes in the house that wasn’t glued to them! Peter Allen as Judge Danforth, delivered lines with an understanding that made you almost sympathetic to this witchfinder general. He got the light and shade of this complex character off to a tee and even injected the odd bit of humour with great timing. Eireann Mason as the vindictive Abigail Williams is obviously a youngster with a future, based on this chilling performance, well backed up by her cohorts Rosa Alaluf (Mary Warren), Jasmine Harris (Susanna Walcott), Emeli Jordan (Betty Parris) and Isabelle Slow (Mercy Lewis) – these girls can send shivers down your spine with just a scream! Ken Wilde as Reverend John Hale paced his performance with considerable skill. I didn’t quite get his measure at first but his conversion from witchfinder to sceptic was deftly done as his character gradually saw the futility and idiocy of the whole scenario. Very subtle! Martin Grover did the same for Rev Samuel Parris, alternating between bewilderment, arrogance and anger, left wondering how his daughter had become a catalyst and refusing to accept the criticism of his adversaries such as John Proctor. Barry Thompson as Thomas Putnam was every bit the scheming, set in his ways, country squire along with his wife Ann (Vicki Roberts). Steff Keightley was a suitable clerk, the walking stick an excellent prop which added a little gravitas to the character (I hope it was a prop and he wasn’t one of the cast’s walking wounded?). Jenny Tymon-Robins was a very good Tituba, but I was a little disappointed that a black actress couldn’t be found in the most ethnically diverse town in Britain and I’m not sure it quite worked as an Irish woman. That said I have now seen this play done several times and can only remember one production that didn’t suffer from the same problem. Becky Woodham as Rebecca Nurse plays the only rational person to react to the initial situation suggesting a doctor instead of a witchfinder. And finally, Roy Taylor (forever to be known as ‘One Round’ to my wife) as Judge Hathorne was a suitable foil for Peter Allen’s Danforth. – I played that part myself exactly a decade ago! I said at the beginning this was not an easy play to watch and I must confess my wife, who had never seen it before found the whole play an extremely uncomfortable watch, but at the same time Sharnbrook’s production of it totally spellbinding. I think that sums up the measure of the high quality of the show Michael Horne and his team presented. Finally – Thank you once again to Dave Oliver and his FOH team for their usual splendid hospitality.